What would a holiday show be without a big family gathering, a little drama, a heap of romance, and some great laughs? 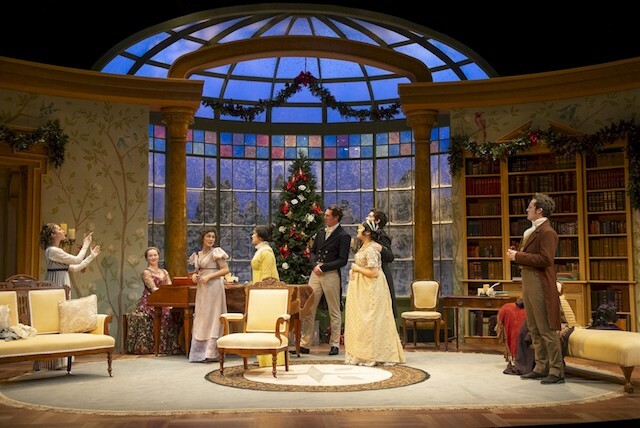 The Arts Club presents Miss Bennet: Christmas at Pemberley on now at the Granville Island Stage until December 30th. Tickets: From $29 online or the Arts Club Box Office at (604) 687-1644. Being an Austen fan, and a fan of seeing local stage productions during the holidays, John and I made a date night out of it. We booked a reservation at The Sandbar (one of The Arts Club’s partner restaurants that offers a show-day discount) and settled in for the evening on Granville Island. The rain drizzled down but we were snug on the covered patio, surrounded by heaters. We selected the current $39 prix-fixe dinner option and sat back to watch the lighted boats in False Creek while we enjoyed a cocktail. When it came time for the show, we walked over to the Granville Island Stage and found our seats. It’s been a while since we were at an Arts Club show here and I didn’t know you can now bring beverages into the theatre with you. A score for anyone looking to enjoy their tea, coffee, wine or spirit during the show. Miss Bennet: Christmas at Pemberley is a sequel to Pride and Prejudice, written by Lauren Gunderson who was cited as the most-produced living playwright in the US, according to American Theatre. In the same season, her play Miss Bennet: Christmas at Pemberley was ranked as one of the top ten most-produced plays. 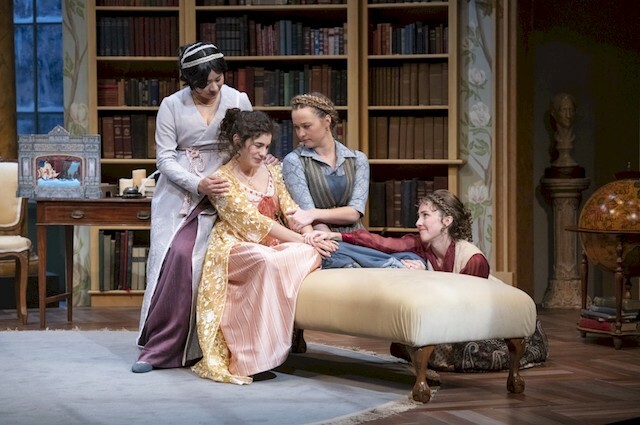 The play centres around Mary (Kate Dion-Richard), the bookish middle child of the Bennets, and is set after Lizzy Bennet (Lauren Jackson) has married Mr. Darcy (Chris Walters) and come to live on his grand estate. Joining them for the holidays are her pregnant elder sister, Jane (Leslie Dos Remedios), and Mr. Bingley (Tim Carlson); her youngest sister, and Lydia (Baraka Rahmani). While Mary starts to dream of a new life beyond her boisterous family, an unexpected visitor at the Darcy household, Arthur (Matthew Macdonald-Bain) could spell romance. Matthew Macdonald-Bain brought an invigorating energy level to the stage, not only as a new character Arthur de Bourgh, but with his comedic timing and presence. The Bennet sisters were as charming as ever (each in their own way of course), and the holiday theme was heartwarming. There’s some very smart comedy at play, along with some of the the silliness you would expect (not only from Lydia). Designer Amy McDougall did a lovely job with the costumes and Ted Roberts’ set was grand (as you would expect from Pemberley) but bright, modern, and cozy with falling snowflakes behind the grand bay window. It’s a cleverly romantic holiday production, perfect for a date night. I received media tickets from The Arts Club to write this review. Opinions are my own.